The smooth surface on laminate activity tables makes it incredibly easy to clean up spills and messes, which is essential in a classroom with young students or in a classroom which frequently uses art supplies. Teachers or students can simply use a damp paper towel to wipe up any spill or mess when it occurs. If sanitizing is necessary, it can be done by using a sanitizing wipe or by spraying the table with a sanitizing spray and wiping with a paper towel. Simple cleaning allows for your classrooms to run more efficiently and helps to avoid spreading germs between students. For younger students, having colorful tables can spark creativity and encourage them to enjoy the classroom. In addition to increasing the students’ enjoyment, you can increase your teachers’ happiness as well by adding bright colors to their space. Colorful laminate options can also help to disguise any potential stains in messy classrooms, such as those with very young students, where such stains tend to be inevitable. In addition to the wide variety of colors available, laminate activity tables come with a notable variety of shapes and sizes: round, half round, octagon, and flower shaped. Having the option of how these tables fit in your classrooms’ space can often open up more floor space than traditional tables, and the fun and interesting shapes give students additional visual stimulation that they cannot get from traditional, rectangular tables. Because laminate activity tables offer adjustable heights, you can use them in classrooms with students of any age. Activity tables are also easily adjusted in height, so teachers can fix the height to their preference. Having the flexibility of changing the height of your activity tables can also allow you to appropriately allocate the tables as class sizes grow and shrink depending on student populations. It is essential to find a trustworthy supplier to provide your school with laminate activity tables if you have decided that they are a worthwhile addition to your classrooms. 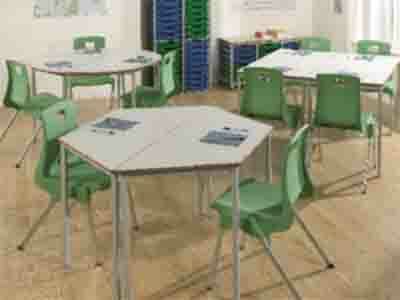 Search online for local classroom furniture suppliers with excellent customer reviews. Ask for references and follow up with those references to learn about how the company was able to handle their order and any issues that may have arisen. Once you’ve found the company you think will be the best fit, be sure to find out how long it will take to receive your new laminate activity tables and if there is any way to expedite that process. If the classroom furniture supplier does an excellent job, consider using them again when you need to upgrade other classroom furniture items.